[SatNews] but astronomers puzzled over how one single monstrous star could ionize a giant HII region. This new Hubble image is the best-ever view of a cosmic creepy-crawly known as the Tarantula Nebula, a region full of star clusters, glowing gas, and dark dust. Astronomers are exploring and mapping this nebula as part of the Hubble Tarantula Treasury Project, in a bid to try to understand its starry anatomy. The Tarantula Nebula is located in one of our closest galactic neighbors, the Large Magellanic Cloud. Hubble has released images of this celestial spider several times before: in 2004 (heic0416), 2010 (heic1008), 2011 (heic1105) and 2012 (heic1206). While these images show striking panoramic views of this turbulent region, this new image gives us the deepest and most detailed view yet. 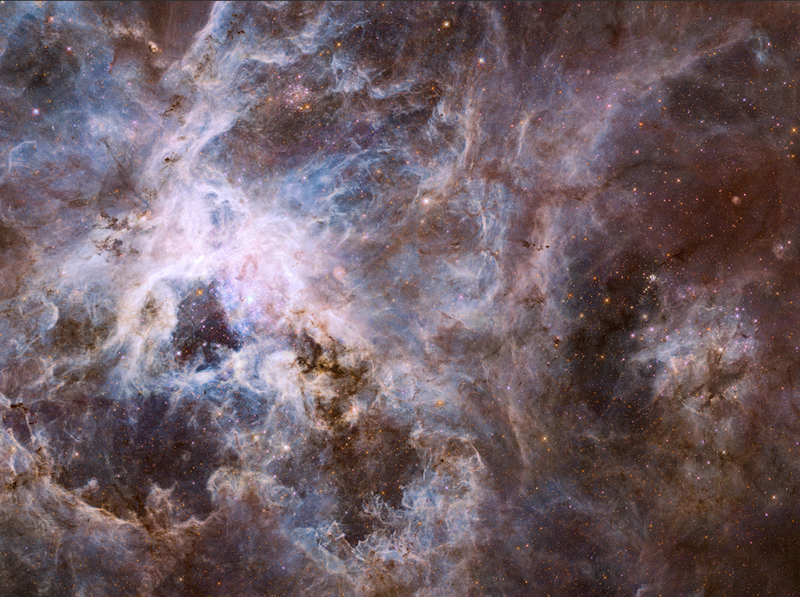 Created using observations taken as part of the Hubble Tarantula Treasury Project (HTTP), this image is composed of near-infrared observations from both Hubble's Wide Field Camera 3 (WFC3) and Advanced Camera for Surveys (ACS). Due to the combination of infrared filters in this image a purple haze fills the frame, with deep red wisps of dust and bright stars scattered throughout. This region is an example of an HII region — a large cloud of partially ionized hydrogen within which new stars are being born. Visible to the left of center is a sparkling star cluster known as R136. It was initially identified as a star, but astronomers puzzled over how one single monstrous star could ionize a giant HII region. However, astronomers later realized it was actually a cluster of stars: a super star cluster. R136 will eventually become a globular cluster: a spherical ball of old stars that orbits around the center of its host galaxy. R136 is so massive that it contributes greatly to the Tarantula's brightness, emitting most of the energy that makes the nebula so visible. The Hubble Tarantula Treasury Project (HTTP) is scanning and imaging many of the stars within the Tarantula, mapping out the locations and properties of the nebula's stellar inhabitants. These observations will help astronomers to view the nebula and piece together an understanding of the nebula's structure . This new image is being released today, 9 January 2014, at the 223rd meeting of the American Astronomical Society in Washington, DC, USA.